Theodora Lynn (Irene Dunne) was raised by her maiden aunts in the small town of Lynnfield, where everyone knows everyone else's business and the smallest deviations from expected behavior cause gossips' tongues to wag. Prim and proper Theodora has secretly written a shocking best seller under the pen name Caroline Adams. Illustrator Michael Grant (Melvyn Douglas), who is intrigued by Theodora, turns up in Lynnfield hoping he can encourage Theodora to break out of her shell, but Michael is as shocked as anyone when eventually THEODORA GOES WILD. I first saw this film in a Los Angeles theater in the '70s and hadn't seen it since, so watching it was almost like seeing a brand-new movie. Dunne and Douglas make an excellent team, with wonderful comedic timing. I find the first half of the film the most enjoyable, as the free-spirited Michael gradually draws out the "Caroline Adams" side of Theodora. The scenes where they go berry-picking and fishing are charming -- Dunne has an infectious laugh which is especially delightful in these sequences. Halfway through the film we learn that Michael is also strongly constrained by convention. I especially liked Theodora's quick assessment of his situation and that she doesn't react in the expected way, which would have been running home to Lynnfield in shocked disappointment. Happily for the viewer, she doesn't react that way at all, but instead sets out to free Michael, just as he freed her. The second half of the film does go on a bit long, as Theodora's exploits become increasingly notorious; I would have liked more quiet moments between Michael and Theodora, just as there are in the first half of the film. Their final scene together at the end of the film ends too abruptly. However, the film does build to a wonderful payoff when scandalous Theodora returns to Lynnfield in triumph. I've been having something of a Melvyn Douglas festival since November, and particularly this year. Douglas made roughly two dozen romantic comedies in his half-century-long career, the most famous of which is perhaps NINOTCHKA (1939). He is an actor for whom I have increasing appreciation. THEODORA is filled with some wonderful performances by a number of character actors, starting first and foremost with Elisabeth Risdon as Theodora's Aunt Mary. Aunt Mary may be starchy, but when the chips are down, she's squarely in her niece's corner. Nana Bryant is wryly funny as the wife of Theodora's publisher, played by Thurston Hall. Robert Grieg takes a break from his typical casting as a butler to play Theodora's black sheep Uncle John. Spring Byington is amusing as a leading Lynnfield town gossip who "gets hers" in the last moments of the movie. And Thomas Mitchell is the small-town newspaper publisher who delights in putting Theodora's escapades on the front page in bold type -- and when the headlines can get no bigger, he then prints one in red! This film was directed by Richard Boleslawski and filmed in black and white by Columbia's great Joe Walker. The movie runs 94 minutes. 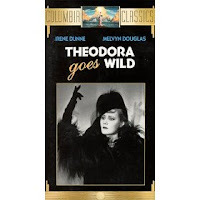 THEODORA GOES WILD has been released on DVD as part of the Icons of Screwball Comedy Vol. 2 set. The other films in the set are TOGETHER AGAIN (1944) with Dunne and Charles Boyer, and two Loretta Young comedies, A NIGHT TO REMEMBER (1943) and THE DOCTOR TAKES A WIFE (1940). This collection is a great buy for those who love romantic comedies of the '30s and '40s. THEODORA GOES WILD has also been released on video. April 2017 Update: I had a wonderful experience seeing this film in 35mm at the TCM Classic Film Festival, introduced by Melvyn's granddaughter, Illeana Douglas. Heh, I just watched this movie the other day! Theodora Goes Wild is one of the best screwball comedies ever filmed, and I continuously marvel at how well it was written (everything comes full circle, there are no superfluous bits of dialogue or scenes or characters, etc). And Melvyn Douglas and Irene Dunne have a wonderful, warm chemistry. It's a shame this hasn't been released on DVD on its own merit--it's just as funny as her Cary Grant collaborations.